Fourth Row Center: Film Writings by Jason Bailey: Backfilling: "Escape from Alcatraz"
Welcome to “Back-Filling,” a regular feature in which I see movies that, by any reasonable measure, I totally should have seen by now. 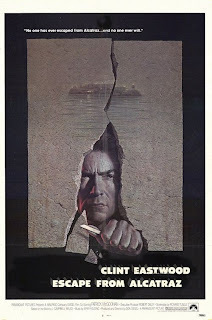 In many ways, the most interesting thing about Don Siegel’s Escape From Alcatraz is how quiet and atmospheric the damn thing is. Oh sure, it’s not without some theatrical flair (Clint Eastwood arrives at “The Rock” in the middle of a thunderstorm, and as he arrives in his cell, the guard’s “Welcome to Alcatraz” is followed by a crack of thunder and a flash of lightning from outside), but it is mainly a process piece, a step-by-step, nuts-and-bolts examination of exactly how this was done. The story is told in short, punchy, workmanlike scenes, punctuated by moments of brutality both expected (his fights with a taunting fellow inmate) and unexpected (a wince-inducing scene with a fire hose). As usual, Siegel’s direction is a model of ruthless efficiency; this is a guy who knows how do get the job done and get on with it. Which is not to say he’s not above some neat tricks, or that he doesn’t shake things up with some moments of bone-dry wit. But he’s a good old-fashioned picture maker who knows when to get the hell out of his story’s way—particularly in the remarkable closing section, which trusts its own suspense enough to dispense with the expected music cues and play (as Rafifi did before it and Mission: Impossible after) in near-silence. That sequence is Siegel in a nutshell: he doesn’t overcook it, just puts it on a slow boil. In Theaters: "The Brothers Bloom"
Oh, No Way I'm Seeing That: "Dance Flick"
Backfilling: "The Palm Beach Story"
On DVD: "Sukiyaki Western Django"
Trailer: Woody Allen's "Whatever Works"